ES-3 converts eight channels of ADAT Lightpipe input to DC coupled outputs on 3.5mm jacks, for the ultimate convenience in connection of a DAW directly to analogue synthesizers. 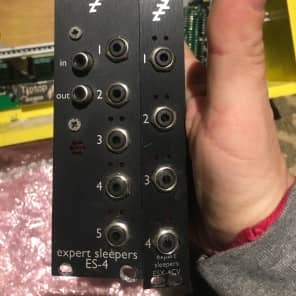 The outputs can be used as control voltages (CVs), for example with software such as Expert Sleepers Silent Way , and can also be used as audio outputs at high, modular synth-compatible levels. The ES-3 produces 8 outputs as normal when the ADAT interface is operated at 44.1/48kHz. In double speed mode (88.2/96kHz), the ES-3 outputs 4 channels, duplicated across pairs of outputs (ES-3 outputs 1/2 carry ADAT channel 1, outputs 3/4 carry ADAT channel 2 etc.). However, users of Silent Way software can take advantage of the Silent Way SMUX plug-in to interleave CVs on the 96kHz stream, restoring the number of usable CV outputs to 8.